because I print the customer's name & address in all the flyers. being printed on all the flyers. put in their 1" C/R All-Profit Ads. This give you the same opportunity to earn the $50 with your flyer. This is a Fantastic Dealership because of the Value in the Reports. There are 42 Reports that have all been retyped and Laser Printed to give you Quality Reports. These Reports range in size from 1 page to 7 pages each and Loaded with Valueable Information. These same reports are sold in each of the dealerships. Each Dealership offers you Quality Reports for your Business. for selling 50 Name and Address Strips with the 50% dealership. you should include this flyer in the package for your dealers to use. include this flyer with your name as the dealer to bring you orders for the Name & Address Strips. This gives you the opportunity to earn another $2 dealership commission. I have included the line at the bottom of the Flyer to help Advertise the Listing Page! "If You Need More Super Dealerships to put your Name & Address Strips in - VISIT - http://inc53.com/Biz"
gives you another way to make $40 for this Dealership from people who don't want to pay $50. This Dealership includes the 42 Reports without the Flyers that sell each report. This Dealership also includes 42 - 1" C/R All-Profit Ads that sell each report. 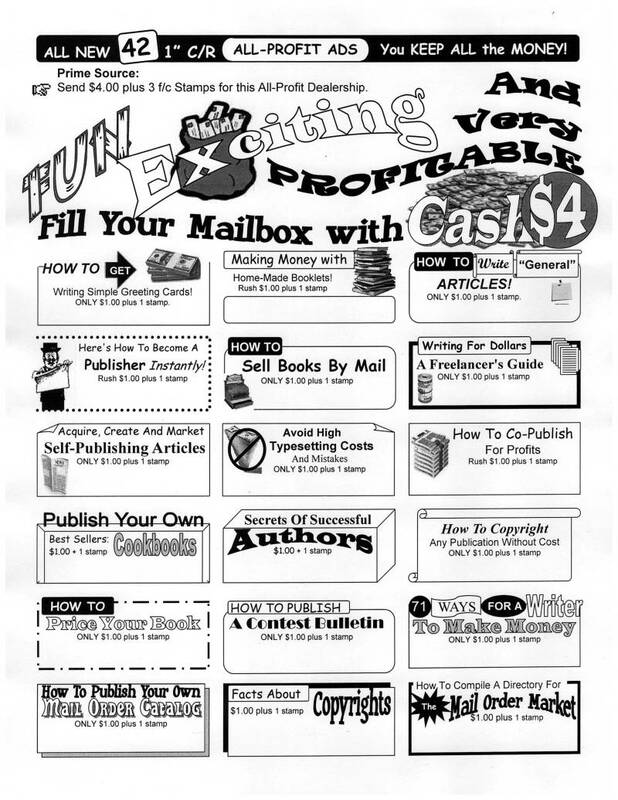 Dealers send this Sales Flyer, the 42 - 1" C/R All-Profit Ads and a copy of all 42 reports. The customers do not get the 50 Free Name & Address Strips nor the flyers that sell each report. include this flyer with your name as the dealer to bring you an order for the Name & Address Strips. gives you another way to make $35 for this Dealership from people who don't want to pay $50 or $40. This Dealership does not includes 42 - 1" C/R All-Profit Ads that sell each report. Dealers send this Sales Flyer and a copy of all 42 reports. is Included in the "Be An Instant Publisher" Dealership. Anyone may purchase this Dealership separately for $4 + 3 stamps. This is the Flyer that I use as the Prime Source. I order & pay for the 50 free name & address strips to get more orders. and not have to provide the name & address strips to every customer. Dealers may sell this Dealership of 42 All-Profit Ads separately for $4.00 plus 3 f/c stamps. The "Another Complete Mail Order Dealership" is actually 44 Dealerships in one. and you can sell them the 50 Name & Address Strips Dealership. without having to paste their name & address into each and every 1" Ad. Mail Order publication to insert as a full page ad. pasting you name in all those 1" Ads. could copy all the ads cutting you out of some sales..